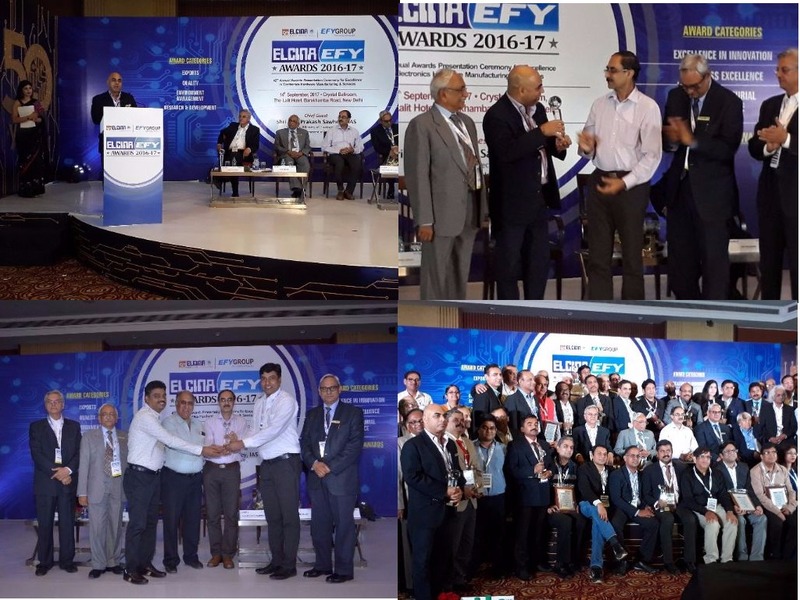 At a glittering ELCINA – EFY awards night at The Lalit, New Delhi on 14 September 2017, our Managing Director, Mr Vinod Sharma, was felicitated as the Electronics Man of the Year 2016-17. It was a double delight for Deki as the company also won the 2nd Prize for Excellence in Environmental Management (Large Scale). Speaking on the occasion, Mr Sharma recounted his journey with ELCINA and how the industry was ready to face challenges and make India proud. He affirmed his commitment towards helping in policy making to help Indian component manufacturing become strong using the inherent brain, brawn and will power in abundance in India. The Excellence in Environmental Management award recognizes Deki's reduction in generation of solid waste and emphasis on the reuse of packing materials and recycling of plastics. The jury also considered Deki's CSR activity of supporting vocational training of girls from economically weaker sections of society as worthy of mention in the award citation. Mr Anil Bali, Mr P Shanker Raj and Mr Rajesh Maurya received the prestigious award on behalf of entire Team Deki. The award will, undoubtedly, motivate the team to give their best in protecting the environment by focussing on reduce, reuse and recycle.